An aggressive dog is not a “bad dog”. The concepts of “good” and “bad” of human morality are not present in The Dog Community and if he is aggressive it is simply because this aggression is useful for him. Having an aggressive dog is one of the most difficult issues that you may encounter when you own one. However, whether your dog is aggressive towards strangers, dogs, children or maybe even you, there are solutions, it is never a fatality. Why is my dog ​​aggressive? 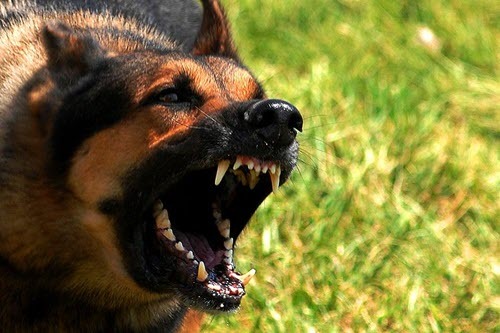 A dog can become aggressive for a very large number of reasons and we will enumerate thereafter the 8 types of aggressivities that are distinguished when analyzing the behavior of a dog. Know that, often, it is because of us that our dogs become aggressive … Sorry to teach you but it is a fact very widely observed in analysis of the Dog behavior. This is certainly the main cause that explains the nascent aggressiveness of a dog. Because, NO, a dog is born “bad”, he becomes, often because of his owner. In fact, if a puppy does not experience a lot of positive experiences during his developmental period, he will not be able to live serenely the new situations that will be imposed on him afterwards. Lack of socialization, especially between the first 3 and 12 weeks of a puppy can have serious consequences. This period is essential because it finally allows the puppy to create a kind of data hard drive that will serve as a base for reference, for all his life. The accumulation of bad experiences (and sometimes only one) is enough to cause a fairly severe trauma that leaves the dog in question no choice but to attack “before being attacked”. In fact, if your dog has repeatedly associated a person, dog or environment with a bad experience, when meeting a new person, a new dog or a different environment, he will be in an unstable emotional state that will then to become aggressive. A master too brutal in his educational approach: an inter-specific relationship based on conflict generates conflict. Violence calls for violence. A too protective master who does not let his dog play with others for fear of hurting him: this is the typical case of small dog masters who have the reflex to carry their dog systematically to every situation supposedly ” critical”. A master who does not understand his dog codes or signals in a situation while his dog clearly shows that he is in a very uncomfortable emotional state. In all the cases mentioned here, it is very often a lack of information on the functioning of a dog, what it really is and how it must be really educated which poses problem. This is the case for dogs that can not share their resources, whether their bowl, their basket or even their human. Teach your dog to wait before eating (sit, do not move, put the bowl down, wait a few seconds and OK). Do not let him have self-service food. One or two meals a day must be offered, at more or less fixed hours. Always initiate the contacts. You must decide the beginning and the end of the interactions with your dog, do not let your dog beg for your attention and get it systematically. Do not disturb him when he is in his basket (it is especially valid when one has children). Teach him to go to his basket on order. Regulate access to the sofa and bed: your dog should not get on the couch when he wants, or if he is, he must be able to get off quickly when you ask him. These tips are to apply to all dogs, whether aggressive or not. These are rules of life inherent to a harmonious integration of the dog into his adoptive family. This is the case of dogs that have hunting instincts (and predation) very marked and often reinforced by throwing games. Here, the goal will be to reduce the instinct of the dog but it will be impossible to remove it. Do not we say “chase the natural and come back at a gallop”? To control the marked instinct of a dog must already let it exist, ie if you adopt a hunting dog, you must accept that it runs after a possible prey. But to accept does not mean to undergo; in fact, at the same time, it is necessary to put in place a good education by putting forward here the notion of renunciation: the “you let”! This is obviously the case of dogs initially selected for care. This type of aggression is also called “territorial aggression” but in my opinion, this term wants everything and nothing to say and is more confusing than anything else. So watch out, all watchdogs are obviously not aggressive. Their mission is more to prevent, protect and intimidate … But some go further and do more than just show fangs when an individual continues his intrusion. Besides, you must know that a dog is born a guardian, he does not become one. It is even forbidden to educate a dog in the guard: either he is naturally, or he is not. This aggression concerns dogs that are unfortunately not understood and which, despite all the signals of discomfort sent, are not spared or left alone. Aggression is therefore for these dogs the last means they have found to escape an uncomfortable, stressful and / or dangerous situation in their eyes. Here, the goal is to learn to communicate respectfully with his dog, to know him and to know how to distinguish the signals that express the discomfort of those who express well-being. This is one of the “worst” assaults because here the dog usually does not prevent … which makes him a potentially unpredictable dog. Your dog’s aggressiveness can be genetic or medical, so it is always best to make an appointment with a veterinarian to diagnose a possible problem of this nature or to send you to a fellow behaviorist to solve the problem. It is often a tool that we do not want to use because of its rather pejorative connotation … But if your dog is aggressive, its use is essential. In addition, if your dog wears a muzzle, you will be much more relaxed and confident, and your dog will feel it during your walks! This is very important because we often communicate our own anxieties and uncertainties and this sometimes triggers the attacks. The educational bases are: recall, renunciation (“you leave”) and static positions (“sitting”, “lying”, “not moving”). If your dog has acquired his three great learnings, you will have much easier to evolve with him. Of course, a well-educated dog will be easier to control than a completely independent dog that only does what he likes and is delivered to himself. A dog does not speak, but he still communicates a lot with us, we still have to be aware of it and know how to read and interpret the different signals he sends us. Do not hesitate to call a professional or read our articles on this topic to know the meaning of each mimic of your doggie and be able to act accordingly and adopt a suitable attitude if necessary. Be sure of yourself, confident and serene because your dog must consider you as his referent, his guide and his landmark. If you are not confident, your dog will not be either. And do not forget that an aggressive dog is not for pleasure … If he comes to attack is that he is really in a very unstable emotional state. To finish, you will have understood because it is a little thread of this article: to socialize his puppy is essential to hope to have a balanced adult dog, with good canine codes and a good adaptation to the changes. Do not hesitate to call in a professional dog trainer to help you find compatible dogs for quality socialization. Brain Training for Dogs Review 2019 – Is this a Scam?